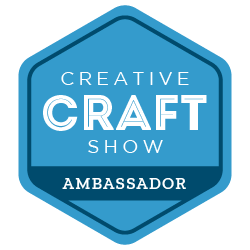 Last Friday I had the joy of spending the day at the Creative Show at the NEC Birmingham. This show is one of those 3 in one events, so once you are in the exhibition hall you can just wander through to the Sewing for Pleasure and the Fashion and Embroidery shows too. You have 3 large exhibition halls full of crafts and craft loving people - what bliss! At the show there are hundreds of stands selling everything from basic paper craft supplies to the latest high tech gadget and everything in between. There is also a workshop area and lots of stands have mini workshops on offer too. The workshops are probably my most favourite bit of these shows. Over the years I’ve been able to try out crafts I’d never done before and this time was no exception. 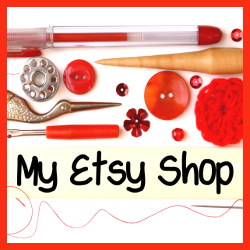 I love the workshops because you take a break, sit down at a table with 4 or 5 other crafters to learn something new together. Of course you have to have a natter as you craft, be rude not to, and I’ve met so many lovely people. If you are here, visiting the blog because I talked your ear off on Friday then ‘Hi, welcome!’ and ‘thank you for making my day so much fun’. You know who you are! 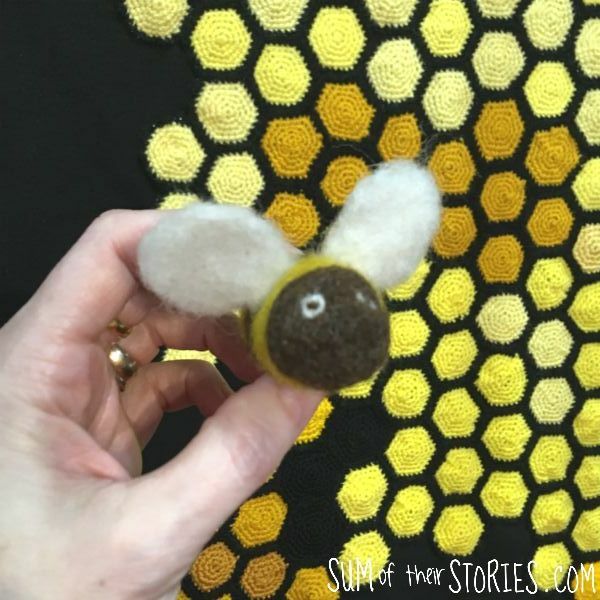 I made a felted bee! I’m SO pleased with my little bee. The wonderful Pat from Grans on the Make showed us how. 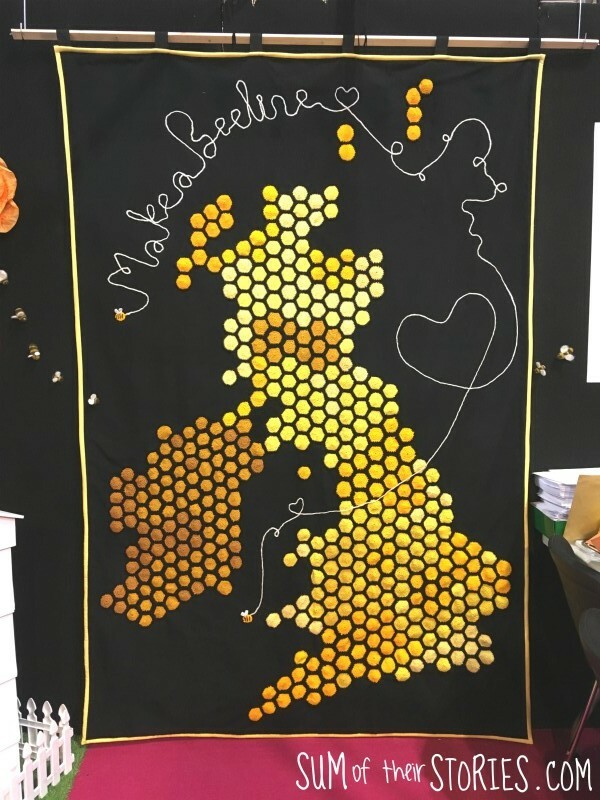 The Make a Bee Line community project are the same folks that made the amazing WW1 commemorative poppy and 100 years of votes for women wall hanging that I was so taken with at last year’s Creative show. You can see my photos of those wall hangings here. This year they have put together a wonderful map of the UK with crocheted hexies, Isn’t it lovely? Along side displaying the wall hanging the Grans on the Make are selling knitted and crocheted bees, donated by crafters all across the country, which have been turned into key rings and brooches etc. Plus the workshops where we got to make our felted bees. And all raising money for charity - wow, these are amazing ladies! 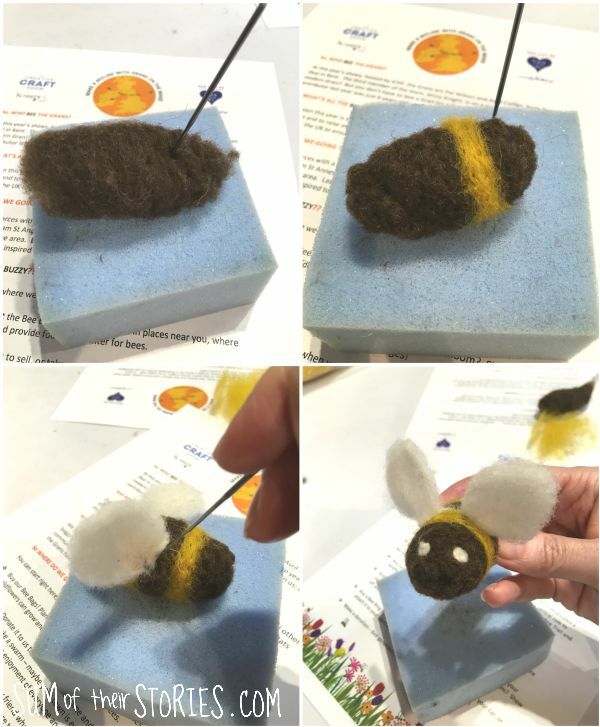 The felted bee was lots of fun to make and I was with a lovely bunch of friendly people which made it even nicer. We all managed to remain fairly injury free (felting can be pretty dangerous!) and had quite a laugh as we all thought we’d made lovely little poops before the strips got added! 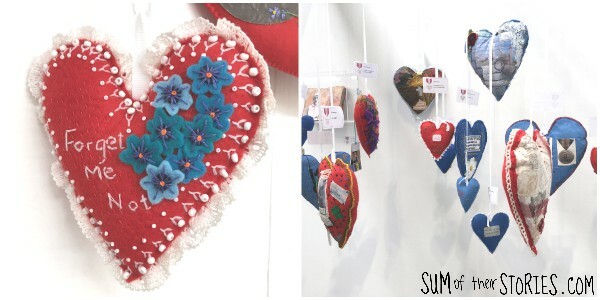 There was a beautiful display of 100 hearts from The Embroiderers Guild. They were all suspended from above and the results were very moving to walk through. You can read more about the project here. Ashmead Designs make clever precut fabric shapes for EPP that replaces the paper and gives a lovely uniform look and feel to hand stitched patchwork. Check out the details on their website. They had a beautiful wall hanging on their stand which really caught my eye. The Bobbin Patch sell a variety of kits, all of them cute but I was especially taken with the felt pincushions that sit on a giant wooden reel. So cute! You can buy the kits from their website. Another little workshop I enjoyed was on the Stampers Grove stand, with Paper Atsy where I tried a little mixed media and made a pretty card. I fell in love with the beautiful embroidery on the Linladan stand and embroidery display. It’s a Swedish company and their story is fascinating. You can read all about them on their website here. The show is not just about things you can try or buy. There are also displays of beautiful costumes, quilts and embroideries. I loved the Handbags through the ages from the National Needlework Archive.